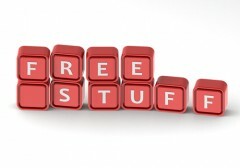 There are 17 19 freebies today. Let us know in the comments if you learn of any more freebies, deals, or discounts! Don’t forget to follow us on Twitter @BargainBabe to snag more freebies. Follow us today! Free Bakery Delights – Print off this coupon good for FREE Bakery Delights at Thorntons stores. Coupon expires April 29, 2013. Free Juice – Langers Juice is celebrating Earth Week with a delicious giveaway. Continuing today at 3 p.m. ET (noon PT) visit and LIKE the Langers Juice Facebook Page to score FREE Langers Juice. Offer expires April 24, 2013 (11:59 P.M. PST). Offer is good for five FREE 5×7 flat stationery cards or five FREE 5×7 folded greeting cards at shutterfly.com. Offer valid for one-time redemption per billing address. Must choose only one of the two offers. Taxes, shipping and handling will apply. HOT! Bruegger’s Bagels freebie – Bruegger’s Bagels is celebrating its 30th anniversary by celebrating with 3 Free Bagel Day next Thursday, April 25 from open until 2 p.m. To get your free bagels, visit the Bruegger’s Bagels Facebook page and click on the “3 Free Bagel” tab to print a coupon or display it on your smartphone at the register of your local bakery. The brand’s email club members will receive the coupon via email.